Matches the latest fashion perfectly: The trend colour olive. The spiral bracelet is also an eye-catcher when worn solo. 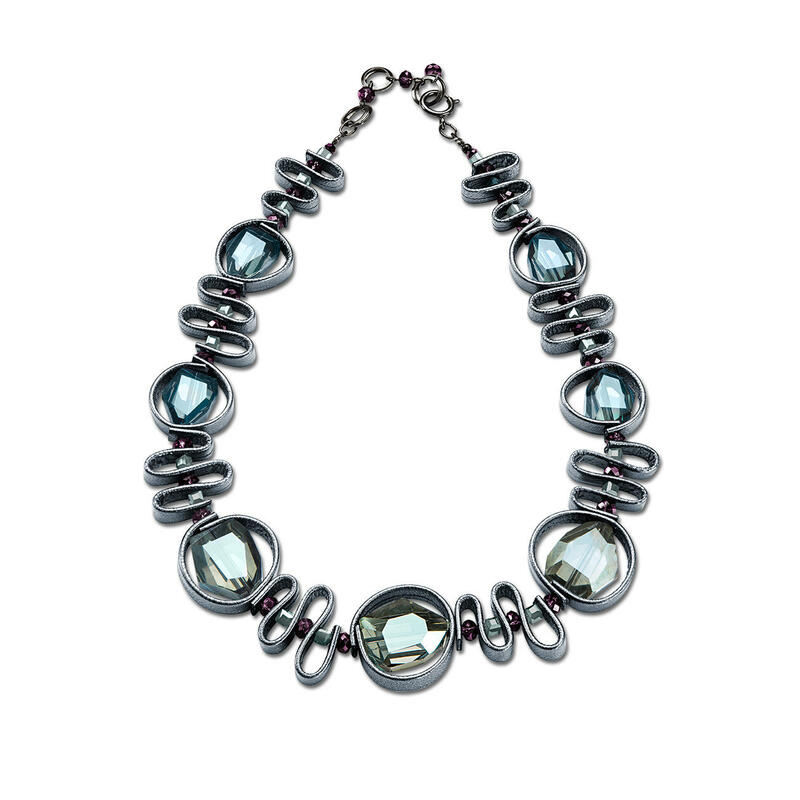 Fashionably lavish – yet really lightweight: This striking spiral bracelet from Langani only weighs 50 grams (1.8 oz). Premium designer jewellery, handmade in Germany. Striking statement collars are still very much in vogue. Unfortunately, many are as heavy as they are opulent. But not this spiral bracelet from the Stuttgart based family company Langani. Richly facetted and polished, the glass stones shimmer mysteriously and appear lighter or darker, greener or more grey depending on the light. The exquisite design of glass cubes, mink discs and acrylic elements looks like the now popular trend of wearing lots of narrow bracelets – but is made in one piece and is much easier to put on and take off. The flexible, claspless bracelet is simply looped several times around the wrist, and adapts perfectly to any size wrist. 5.5cm wide (2.2″). Weight approx. 50g (1.8 oz). Exclusive to Fashion Classics.